The NBA season tipped off Tuesday, and TNT took the party to San Francisco to celebrate last years champions, the Golden State Warriors. For its coverage, TNT set up a temporary broadcasting location at Pier 43, next door to the often touristed Pier 39. The space was transformed to include a large LED basketball court, performance stage, viewing area for fans and broadcast set. 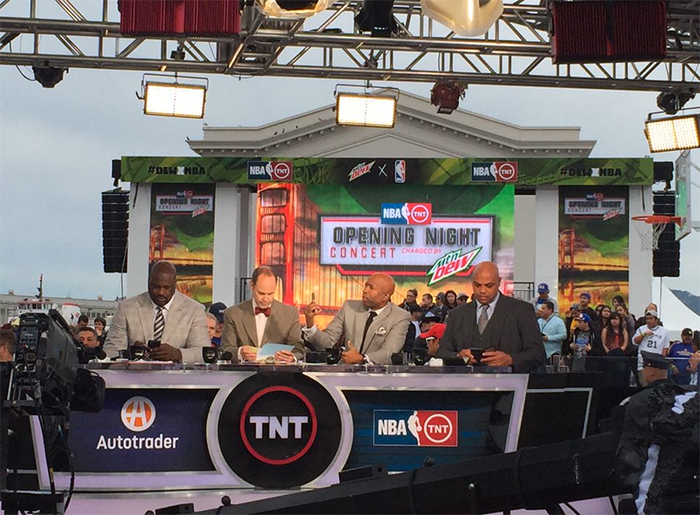 The entire “Inside the NBA” team of Ernie Johnson, Charles Barkley, Kenny Smith and Shaquille O’Neal were on site for the broadcast, which included a doubleheader of basketball action. 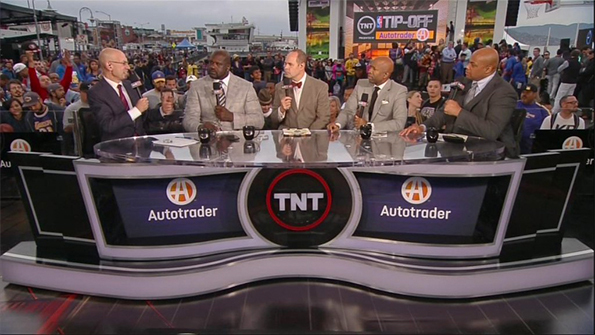 The set included a desk branded with the new “NBA on TNT” logo and a large monitor wall behind, erected on the pier facade. Sponsor logos and branding were heavy throughout, wrapping around the structure and present on the desk. We’ll have more coverage of the “NBA on TNT” Thursday, as the regular season begins and the broadcast moves to Atlanta.